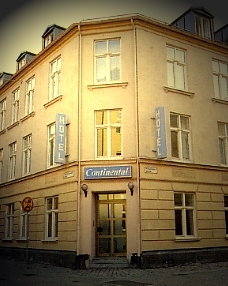 The Continental Hotel is a traditional Swedish building situated on a quiet pedestrianised street in the centre of Malmo, 27 kilometres from Copenhagen. The 54 air- conditioned guestrooms are laid out over four floors and have modern decor in muted colours. All have complimentary high-speed Internet connections, clock radios, and cable television and wake up calls are available. Guests can enjoy a meal at the Continental Hotel Restaurant, which offers international dishes in an informal setting. Alternatively, guests can take advantage of 24-hour room service. For business clients, the hotel has meeting and conference rooms and a dry cleaning service and currency exchange are also on offer. Parking is available for those arriving by car, and for guests' convenience the hotel has a lift. There is plenty to see and do in the area with a casino 50 metres from the hotel and the shops and restaurants of Malmo nearby. Copenhagen with its port, 17th century New Royal Square and Marble Bridge can be found 27 kilometres away. Malmo-Sturup Airport is approximately 30 kilometres and a 45-minutes drive from the hotel.